The need in Burma is great. 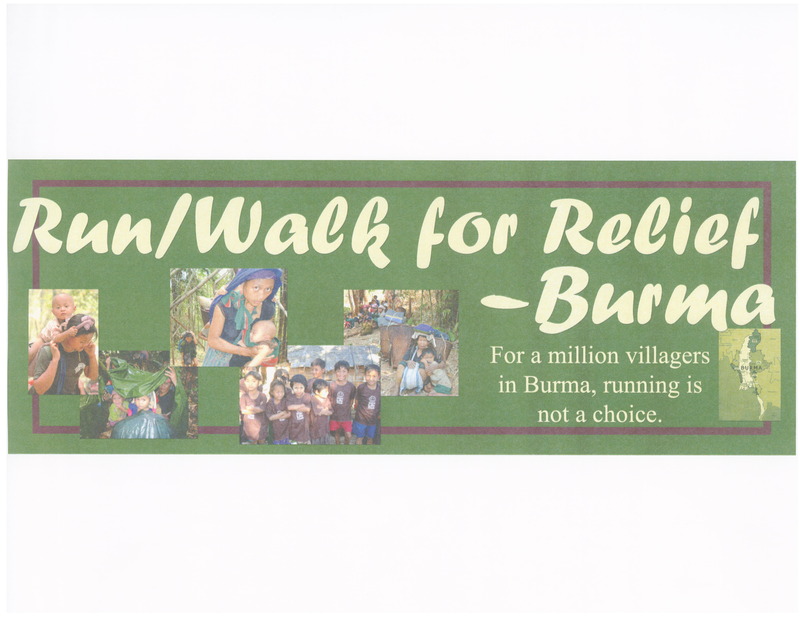 A Run for Relief can raise funds, awareness and energy to help bring about freedom, freedom to enjoy life, liberty and even running in Burma. The Race Director is an extremely valuable contributor to a Free Burma! Many people may be involved in your Run. Experienced athletes, teams, families, walkers, non-runners who wish to help. Considering the hopes, needs and desires of each will help your Run succeed. Communication times: Immediately before start and during awards after best times for runner's and volunteer's attention. Certification? Courses may be "certified" with respect to distance such that times may qualify for recognized distance records. Registration: Divisions (Youth 0-12)(Teens 13-18) (Open 19-39) (Masters 40-up). Chiang Mai has separate "flip-flop" division. Awards: Finishers and volunteers gather. good time for announcements regarding Burma and prior races (review records). Thank sponsors. Projected slide show of past events. Ribbons for division leaders. Trophies. Consider purchasing Teak trophies made by Karen from Thai-Burma border. Results: If using database to record, remember how to format times; Excel assumes a colon (:) separates hours from minutes. If you enter a time, consider entering a zero hour, colon, minutes, colon, seconds.tenths like 0:17:30.5. Template Excel and Numbers (mac) are available for download. Send results to local news media early. Some like first 50 to first 100 listed in order with times in a WORD document.